Twinkle Wonderland's pop'n music banner. 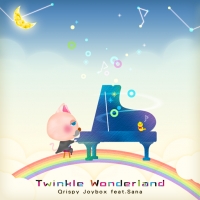 A long version of Twinkle Wonderland can be found on Qrispy Joybox's Twinkle World maxi-single. It is also included on Sana's Sana Coffret compilation album. The Qrispy BGM in REFLEC BEAT limelight is based on Twinkle Wonderland. Twinkle Wonderland appears as part of the medley The 4th KAC DJ TOTTO's SELECTION, from REFLEC BEAT groovin'!! Upper. Twinkle Wonderland marks Sana's only original song for the REFLEC BEAT series. It also marks her final original BEMANI song, as she left KONAMI in 2012. Twinkle Wonderland is the first FINAL ROUND song of REFLEC BEAT limelight. There aren't special requirements to make it available. Once having played Twinkle Wonderland several times in its FINAL ROUND status, it will be unlocked indefinitely. In REFLEC BEAT colette, Twinkle Wonderland was unlocked by reaching the first part of limelight Mountain in Pastel Adventure. From REFLEC BEAT groovin'!! to REFLEC BEAT VOLZZA 2, Twinkle Wonderland was playable by default. In pop'n music, Twinkle Wonderland was first made playable in the pop'n music Sunny Park location tests as a hidden song, and shortly after, in pop'n music 20 fantasia as part of the pop'n music Sunny Park & REFLEC BEAT colette Location Test Memorial Event. Before Twinkle Wonderland was added, pop'n music 20 fantasia was the only arcade pop'n music title without a new Sana song. This is also mentioned in masaru's and wac's staff comments on Twinkle Wonderland. Twinkle Wonderland received an EASY chart in pop'n music Sunny Park. However, this chart is identical to its old 5-Buttons chart. REFLEC BEAT mascot Pastel-kun makes a cameo in Twinkle Wonderland's pop'n music banner and SANAE♥chan's portrait. Twinkle Wonderland is one of jubeat saucer's Only Now Songs (いまだけ楽曲). It could be unlocked from November 19th to 26th, 2012. From November 27th, 2012, it could be unlocked via bistro saucer. Twinkle Wonderland was removed from jubeat saucer on April 1st, 2013. It was later revived on July 15th, 2013. It was removed again on October 1st, 2013. It was revived again on February 1st, 2014. Twinkle Wonderland received a SPECIAL chart in REFLEC BEAT groovin'!!. It could be purchased at the REFLEC Shop for 1200 Refle, after clearing the chart and subsequently completing the Qrispy Test (Qrispy検定) in REFLEC Dojo. From July 4th, 2014, it could be purchased without prerequisites. In REFLEC BEAT VOLZZA, it could be purchased from the Garage for 8 VOLZZA KEYs. In REFLEC BEAT VOLZZA 2, it could be unlocked by clearing its HARD chart a specific number of times, depending on the grade obtained on it (AAA+: 1 time, AAA: 2 times, AA: 3 times, A or lower: 5 times). After being removed from the initial release of REFLEC BEAT 悠久のリフレシア, Twinkle Wonderland was revived on February 23rd, 2017. Twinkle Wonderland was added to ノスタルジア on March 15th, 2017 as part of the NOSTALGIA launch memorial song crossover campaign (ノスタルジア稼働記念 楽曲交換キャンペーン). Twinkle Wonderland's SPECIAL chart can be purchased on REFLEC BEAT plus from April 24th, 2017. Twinkle Wonderland's audio and stepcharts could be found on the DanceDanceRevolution A data until an unknown date. Refreshing sensation 200%! Surrender yourself to the high-speed beat of the wonderland that is coming soon! Actually, there's a long version of this song! It was included in the special offer maxi-single that came with "REFLEC BEAT limelight". It is quite rare. By all means! If you like this song, please look for friends that have the special offer maxi-single and listen to the long version!! Oh... it is also included on "Sana Coffret". BeatStream difficulty rated from 1 to Kami (神) in アニムトライヴ. This page was last edited on 5 March 2019, at 01:44.